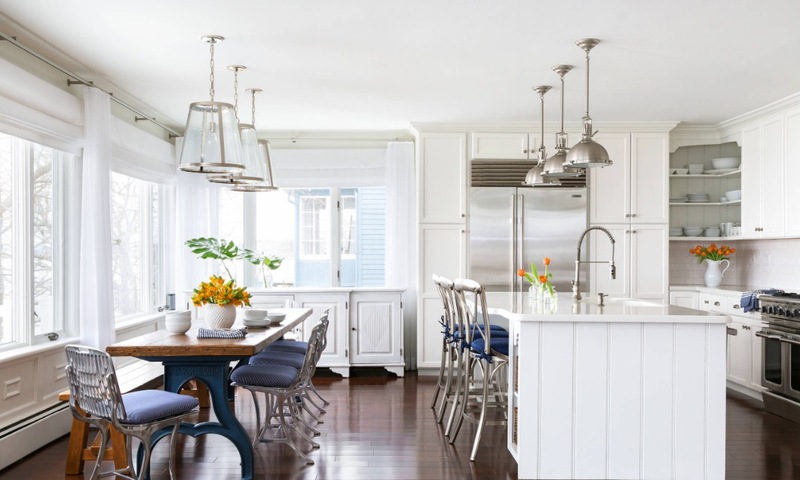 Living in your home while renovating your kitchen comes with a certain level of chaos, but a little forethought can help you make it through. Plan for simple meals and lots of takeout. Think sandwiches, soups and anything that can be grilled. If you’ll have access to a fridge, consider making and freezing meals that can be added to a slow cooker as needed. Factor takeout costs into your renovation budget and look for restaurants with daily deals such as kids eat free or two-for-one specials to help ease the financial strain. Set up a temporary kitchen. Ideally, this will be away from the construction zone and close to a water source. Make sure the electrical outlets in your “kitchenette” can handle small appliances and a mini fridge, if possible. Plastic drawers on wheels work well for storing dishes, utensils and non-perishable food, and be sure to protect your temporary countertops from hot dishes. Helpful items for your makeshift kitchen include: a microwave, coffee maker, electric teakettle, slow cooker (or Instant Pot), toaster oven, electric grill, cutting board, sharp knives, grilling tools, dish soap, scrub brushes, dish towels, a few spices, and a large tray to carry food to your eating area. Control the mess. There will be days when you just need to use disposable plates and utensils, but relying on them too much creates a lot of waste. Try keeping only one place setting per family member, which will force you to wash dishes right away. If you’re rinsing plates in a bathtub or bathroom sink, catch stray food scraps with a drain strainer to prevent clogs. Expect delays. It’s helpful to practice patience if or when the contractor encounters “unforeseen issues” after tearing out the old cabinets, your new stove arrives 10 days late or the plumber accidentally floods the adjoining laundry room. Keep your sanity. Designate at least one room in your home that’s construction-free and tell your contractor, if necessary. Having a peaceful place to escape during renovations can help your family regain a sense of normalcy along the way. Five Star award Winner 2011-2019 honoring the top 7% of real estate professionals in Oregon. The next time you find yourself procrastinating about decision-making, ask yourself these questions to help you reach a conclusion (without pulling your hair out). Does this fit with my long-term vision? When you have clarity about your goals for your personal or professional life, smaller decisions come into focus. Is this good enough? Expecting perfection will only leave you wanting. If you have an option that fits your goals and it’s something you feel proud of, you may have found your answer. What’s my gut instinct? Many decisions don’t have an obvious right or wrong option. If you’ve weighed the pros and cons and you’re leaning a certain direction, go with your gut. Am I making this too complicated? Talk to people you trust about any fears that are holding you back, and determine the realistic consequences of this decision. Oftentimes you’ll find you are more equipped to handle them than you think. When you release unnecessary worry, you’ll be free to make decisions with confidence. I hope this helps. If you need help or information o deciding whether to buy or sell, please call, email, or text me. We can walk through all of your options.